Scott Kellerman Foley (born July 15, 1972) is an American actor, director, and screenwriter. Foley is known for roles in television shows such as The Unit, Felicity, and Scandal, and in films such as Scream 3. He has also guest starred in series including Grey's Anatomy, Dawson's Creek, and House. Foley was born in Kansas City, Kansas, the first of three boys for Connie and Hugh Foley. His father was an international banker, and the family lived in Japan and Australia during Foley's childhood. The family settled in St. Louis, Missouri when Scott was 15 years old. His mother died from ovarian cancer when he was a young boy. Foley attended Ladue High School, before graduating from Clayton High School. His ancestry is Northern European: English, German, Irish and Scottish. Foley's breakthrough role was playing Noel Crane on Felicity. Foley has had recurring guest appearances on Scrubs as Elliot Reid's boyfriend, Sean Kelly, and on Dawson's Creek as Cliff. Foley was nominated for a Teen Choice Award for Choice Movie Villain for his role in Scream 3. Aside from acting, Foley directed one episode of Felicity (called "The Graduate"), one episode of Monk, called Mr. Monk and the Employee of the Month, in season 3, and three episodes of Scandal. In addition, he had a starring role as Sergeant First Class Bob Brown in the CBS military drama The Unit, during its four-season run, and directed one episode. He guest-starred as a drug-addicted baseball pitcher on House. He also produced the sitcom A.U.S.A., on which he appeared. Foley appeared in three episodes of ABC's comedy Cougar Town. He signed on to play a businessman being shown houses by the show's resident real estate agent, Jules, played by Courteney Cox, reuniting with her nine years after Scream 3. Foley and Cox's characters began dating, but it ended quickly. After appearing on Shonda Rhimes' Grey's Anatomy, Foley appeared as a guest star on the second season of her hit show Scandal as Captain Jake Ballard. Later that year he was added as a regular to the cast. Foley portrays the lead character in ABC's drama Whiskey Cavalier, which premiered on February 27, 2019. Foley made his feature film writing and directing debut in 2013 with Let's Kill Ward's Wife. Foley's wife, Marika Domińczyk, and his brother-in-law Patrick Wilson star in the film, along with Donald Faison, Amy Acker and Nicollette Sheridan. On October 19, 2000, Foley married actress Jennifer Garner, whom he met when she guest-starred on Felicity. Foley and Garner separated in March 2003 and Garner filed for divorce in May 2003. Foley became engaged to Polish-born actress Marika Dominczyk in 2006, and in June 2007, the two wed in a private ceremony in Hawaii. They have three children: daughter Malina and sons Keller and Konrad (b. November 13, 2014). Through that marriage, he became the brother-in-law of actress Dagmara Dominczyk, his wife's sister, who is married to the actor Patrick Wilson. In episode 2 season 7 of the genealogy reality program Who Do You Think You Are?, it was revealed that Foley had an ancestor, Samuel Wardwell, who was a defendant in the Salem witch trials. Another ancestor, Simon Wardwell, was a member of then General George Washington's "Life Guard" during the Revolutionary War. 1995 Sweet Valley High Zack Episode: "Blunder Alley"
1997 Step by Step Jeremy Beck Episode: "A Star Is Born"
2002 Girls Club Wayne Henry Episode: "Pilot"
2004 Jack & Bobby Lars Christopher Episode: "Election Night"
2005 House Hank Wiggen Episode: "Sports Medicine"
2009 Law & Order: Special Victims Unit Dalton Rindell Episode: "Hammered"
^ "Scott Foley". TVGuide.com. Archived from the original on September 13, 2015. Retrieved July 16, 2014. ^ "Acting Up". alivemag.com. Retrieved October 4, 2015. ^ Natalie Abrams (October 30, 2009). "Scott Foley to Guest-Star on Cougar Town". TV Guide. Archived from the original on October 17, 2015. Retrieved August 25, 2015. ^ Profile, tvline.com, January 15, 2013; accessed August 25, 2015. ^ "'Scandal's' Scott Foley Directs Donald Faison in 'Ward's Wife'". eurweb.com. June 14, 2013. Retrieved June 16, 2013. ^ Susman, G. "Syd Dishes", Entertainment Weekly, May 30, 2003; retrieved December 12, 2006. 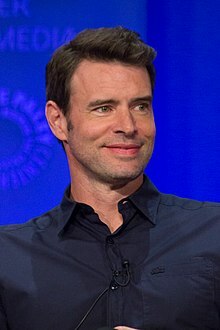 ^ "It's Official: Scott Foley Is Hitched". E! Online. Archived from the original on June 11, 2007. ^ Webber, Stephanie (November 19, 2014). "Scott Foley's Wife Marika Dominczyk Gives Birth, Couple Welcomes Baby Boy Konrad Foley". Us Weekly. Retrieved November 3, 2016. This page was last edited on 2 April 2019, at 12:58 (UTC).